If you want to get a heart-pumping cardio workout while enjoying a beautiful, snowy, and peaceful landscape, give snowshoeing a try. My love for hiking got me interested in snowshoeing initially—even with the best hiking boots, it’s not always easy to get around when the ground is covered in snow. With snowshoes I’ve easily walked on several feet of snow! Best of all snowshoeing is an easy activity to master activity for people of all ages and fitness levels—you can stroll at a slow pace or even run on snowshoes! It’s one of my favorite ways to get outside in the colder months. One of the really great things about snowshoeing is that it’s extremely easy to learn and you don’t need to take lessons. If you can walk, you can snowshoe. That being said, it will take probably take you few steps to get used to the feeling of wearing snowshoes and how they will affect your stride. Snowshoes can feel a little bulky at first and you may have to walk a little different than usual. The good news is that unlike some other winter sports, the learning curve is fairly minimal and it’s easy to pick up within a matter of moments. 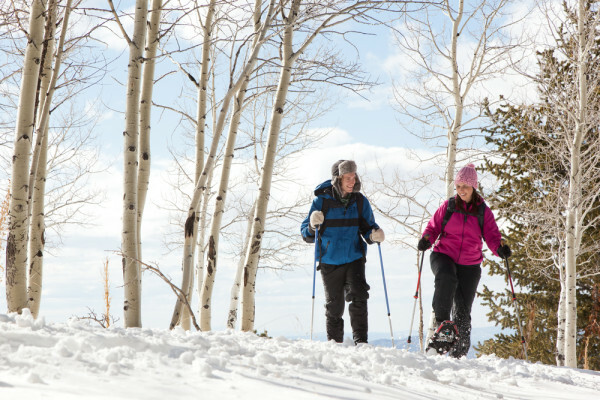 You’ll definitely work up a sweat while snowshoeing—all while burning an estimated 600 calories per hour. You can just use snowshoes or you can pair them with poles like the kind used for skiing or Nordic walking. Poles will increase your calorie burn and can also help you navigate tricky areas, such as walking up for down hills or over uneven terrain. For further details on what to expect on your first time out (and why snowshoeing is great in general) check out this article. Make sure that you have all of the proper gear (listed below). There’s no need to sign up for lessons, as you can easily teach yourself. 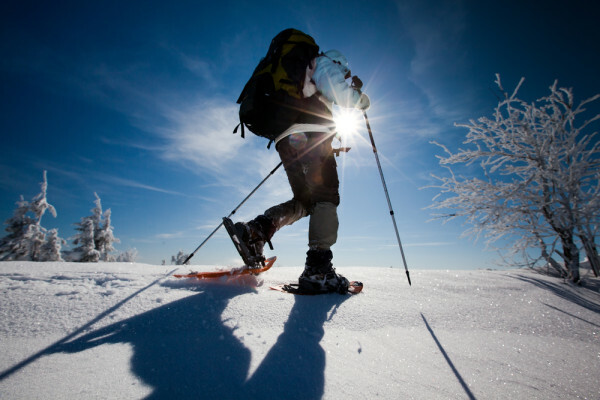 Snowshoeing is basically just like walking or hiking with different footwear. The best snowshoeing conditions occur when there’s a significant amount of snow on the ground. You can snowshoe on pretty much any a trail that you would normally hike or walk, and you can also “break trail”, going off on your own in the woods. Just be sure to pay attention to your surroundings. If it’s snowing, your tracks can get covered up, making it harder to find you way back. Also, take the length of the trail into account, as snowshoeing is a bit more strenuous than just walking or hiking. A mile or two is often a great place to start. First and foremost, you’ll need a pair of snowshoes. Keep in mind that showshoes come in all different varieties (even women-specific!) and have changed a lot over the last few decades. Most are sorted by weight (you might want to go 10-15 pounds higher than your scale weight to account for winter clothes, a backpack, and so forth) and are suitable for a few types of conditions (deep snow, running, etc.). You can buy your own pair or rent them from an outdoor/ski shop or at a resort that has a Nordic center. You’ll also want to get a pair of trekking poles, which offer invaluable stability and balance. If you have ski or hiking poles, you can use them for snowshoeing, but you’ll want to make sure that they have large baskets—basically a plastic disc around the tip that helps them from sinking into the snow. 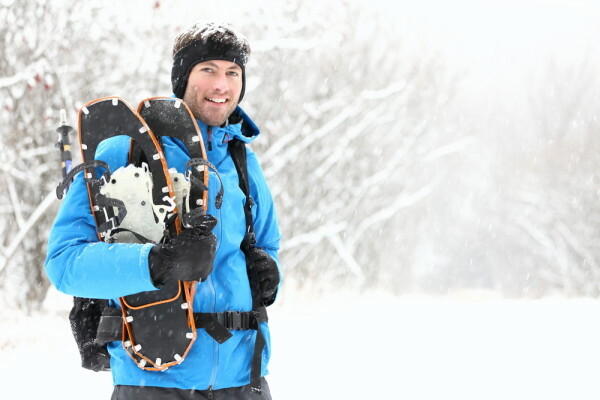 Snowshoes don’t require special footwear but it is wise to pair them with high-top hiking boots or mid-calf snow boots to keep any snow from sneaking into your shoes. The boots should be waterproof and comfortable. Chances are, if you live in a place that gets snow you already have a pair of these in your closet! Choose clothing appropriate for the weather, and wearing layers in optimal. Outer layers (jacket and pants) that are waterproof are ideal, as well as waterproof gloves and a hat. A wicking base layer will keep you dry; you may also want a warm, removable mid-layer. Be sure the socks you wear are comfortable and thick enough to provide extra padding and insulation. Bring along a backpack with snacks and water, especially if you’re going on a longer trek. Many ski resorts also offer snowshoeing and cross-country skiing trails, but they usually charge a fee to use them. They also offer guides, which can help point out interesting landmarks and wildlife. 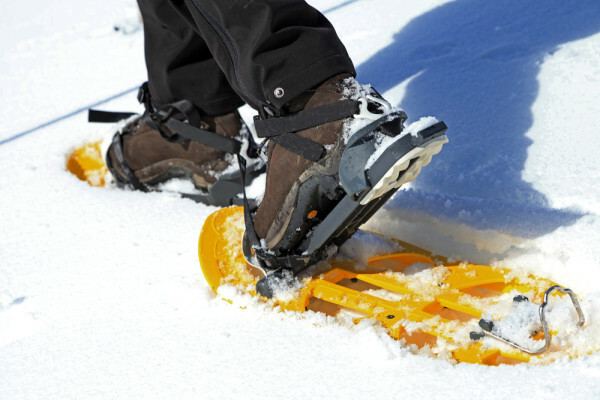 Make sure that your snowshoes are strapped on properly and fit comfortably. They should be secure but not overly tight. Be aware of what you’re walking on top of (as in, whatever is buried in snow below you) and never, ever walk on thin ice! Above all, have fun!